2009 a project to convert Bit Viking to run on LNG fuel was initiated and the vessel is in operation from 23 October 2011. Tarbit Shipping AB is operating the vessel and responsible for the conversion by Wärtsilä, and Statoil is chartering the vessel and supplying LNG bunker fuel. Bit Viking is a purpose built vessel for coastal deliveries of petroleum products. The vessel has been on time charter to Statoil since she was built in 2007, and is operating on the Norwegian coast. The vessel is used to transport petroleum products from Mongstad refinery to terminals along the coast. Tarbit Shipping AB and Statoil have cooperated in conversion of Bit Viking to use LNG as bunker fuel in order to reduce emissions. The conversion of the vessel includes modification of the two main engines to four stroke dual fuel LNG/diesel. The main fuel for the vessel is LNG, but the dual fuel solution enables the vessel to run on traditional fuel (marine diesel oil) as backup securing safe and reliable operations. Two LNG fuel tanks each with a capacity of 500 m3 has been installed on deck. The conversion has been conducted by engine manufacturer Wärtsilä and represents the world’s first LNG bunker conversion of a non LNG tanker. Tarbit has been granted a contribution of up to 75% of the conversion cost from “Næringslivets NOx-fond”. This represents the highest contribution given by the fund in 2011, and expected reduction of NOx 90%, SOx 100% Particles 99% and CO2 20%. 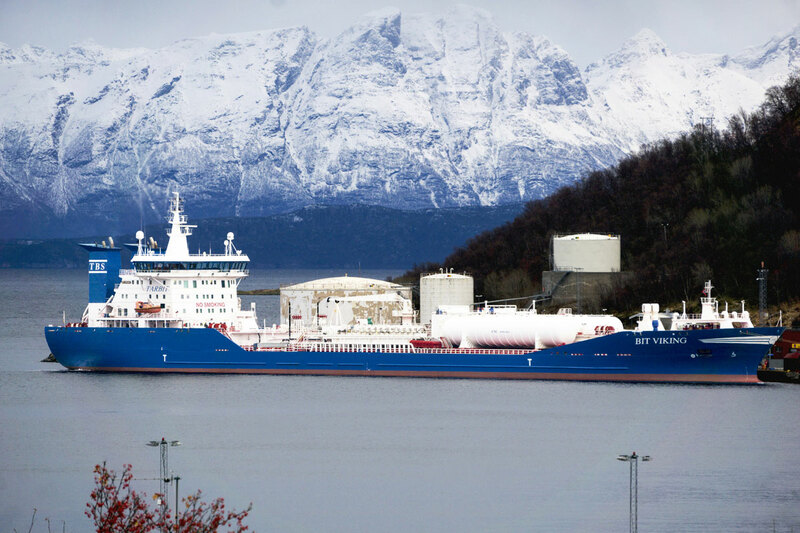 Therefore, Statoil has entered into supply agreements for LNG bunkering with Skangass at Risavika. The first bunkering operation was performed at Risavika in October. “The conversion of Bit Viking to LNG bunker represents a big step towards a more environmental friendly shipping operations. The vessel has a very high safety standard enabling secure operations on the Norwegian coast from Oslo to Hammerfest”, says Karl Brekke, manager trading in Statoil Crude oil, liquids and products.